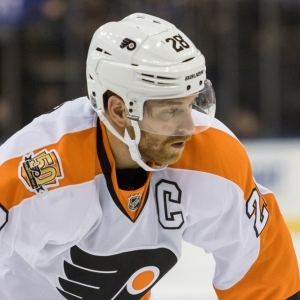 The Philadelphia Flyers are a team that has really struggled to remain relevant in recent years. They show flashes of real strength, but they can't sustain it. They have made the playoffs in three of the last six seasons but never two years in a row. And now they face a massive challenge. They have to maximize the careers of guys like Claude Giroux who aren't going to be big time players forever while at the same time breaking in a whole lot of young players and trying to figure out what they have and what kind of team they can be. They are attempting to retool on the fly without losing too much ground and to get back into the playoffs. The highlight of the offseason was some good luck at the draft. Not making the playoffs got them into the lottery, and they wound up with the second pick. They took Nolan Patrick, a center from the WHL who spent much of the last two years as the consensus top prospect but fell to second after a sports hernia injury cost him much of last season. Patrick is not a special talent in the mold of Connor McDavid or Auston Matthews the last two years, but he's big and smart and should be a strong player. He stands a solid chance of making the team. They had a second first-round pick after trading away Brayden Schenn, and they grabbed another nice center in Morgan Frost, though his time is not now. Losing Schenn costs them some offense, but it was time to move on, and the haul for him was good. The team did some shuffling in net. They favor a two-goalie system, and they let Steve Mason leave to Winnipeg and replaced him with Brian Elliott. Elliott had an inconsistent year in Calgary last year, but he had a strong stretch of games before an unfortunate playoff swoon, and he's easily capable of being half of what should be a better duo than they had last year. The other move of note was allowing Michael Del Zotto move to Vancouver as a free agent and not really putting up a fight to keep him. And they let Nick Schultz walk, too. They haven't brought in an established defenseman to replace them, which is a clear sign they intend to go young. And that is totally the right way to go. Samuel Morin and Robert Hagg played a little last year, and Travis Sanheim and Philippe Myers are knocking on the door, too. Young defenseman are a real area of strength for the squad. They have shown they can handle young guys well, too - Ivan Provorov had a very solid year last year at 19 while playing real minutes. Giroux was recovering from two surgeries and was a shadow of himself last year. He absolutely needs to bounce back this year for this team to improve. He's the offensive star of a team that should be able to score but won't be particularly deep with the offensive consistency. Jakub Voracek is another top line guy who has to do more. An interesting forward is Oskar Lindblom. The 20-year-old will be a rookie after scoring 47 points in 47 games in the Swedish Hockey League last year. This is a huge step up in class for him, but he could play a nice role. Goaltending should be somewhat improved. The offense should be better. And though the defense is going to be young on the back end, it is far from the worst unit in the league. Last year the team was somewhat in the wild-card race but wasn't scaring anyway. This year they are likely to be in the heart of that race again but as a more viable contender this time around. The team gets a brutal test right out of the gate, opening with a three-stop trip through California, with a stopover in Nashville on the way home. That could easily go badly. They get their next five games at home, but it's not any easier. Their first 11 games are against likely playoff teams, so Philly could easily find themselves in a big hole before they know it if they aren't ready out of the gate. This is not the kind of schedule you would like to break in a young defensive unit against. Bovada has Philadelphia at +5000 to win the Stanley Cup, which puts them behind 20 teams. That means that they are on the fringe of the playoff battle, which feels right. BetOnline has them at +2000 to win the Eastern Conference, which is behind 10 teams. They are at +1400 to win the Metropolitan Division. The season win total is set at 38. Last year they won 39. I like this team more than I did last year, but they are going to be in tough to improve significantly in a conference that is pretty deep in the middle tier. They will more clearly be moving forward than they were last year and should be in the realm of 90 points - which will have them in the wild card fight. It's more likely that they miss the playoffs than make them, though.